Hand controls are installed into vehicles to allow people who can't reach the gas and brake pedals to drive. They are normally a lever of some type that is mounted under the steering wheel of the vehicle and connected to the gas pedal and the brake pedal. However, MPD have a few designs that mount at the side of the center console and operate the pedals with cables. The position and function will vary a bit between models and brands but generally the user will push the lever to operate the brake pedal and either pull, rotate or twist the handle to operate the gas pedal. Column mounted and controls can be set up to be operated with either the right or left hand. The control handle will be below and to the right of the steering wheel for right handed use and below and to the left of the steering wheel for left handed use. 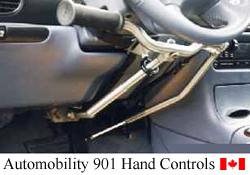 Hand control installation also varies between models but almost all column mounted models are suspended from the steering column. Some are attached using a bracket of some sort and others use a strap arrangement. Depending on the model and style the installation may be achieved without modifications or drilling of the vehicle. If it is important that your vehicle remains without modification you can ask your supplier to find you a model that will meet your needs but be aware that the you may be limited in style and function. Most hand controls can be removed a reinstalled in other vehicles but new parts may have to be purchased such as longer or differently shaped linkages or cables. Hand controls can only be installed in vehicles with automatic transmissions and power steering. Hand controls do not normally prevent or inhibit other drivers from driving the vehicle in the conventional way. Many jurisdictions require the hand control user to take a driving test in order to use them legally. Check with your local transportation authority for requirments in your area. Because the hand control user will only have one hand free for the steering wheel spinner knobs are often used to make steering easier. In cases where the user's feet rest near the pedals it's recommended that pedal guards be installed to prevent their feet from accidentally coming in contact with the pedals and overriding the hand controls. 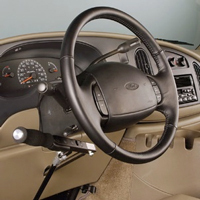 Most wheelchair vendors and home health care stores should be able to order hand controls for your vehicle. Because manufacturers often require that their dealers also provide installation of hand controls for safety and liability reasons not all retailers are able to provide service.